Reading progress update: I've read 38%. Debbie of Debbie's Spurts put me on to this book yesterday and I couldn't resist starting it. 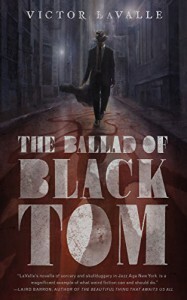 Published in 2016 this novella calls on Lovecraftian lore but has a black man as the main character and is set in 1920's New York City. The text is full of energy. It does a great job of showing how alien and alone a black man could feel outside of Harlem and it builds a strong main character. I'm enjoying it more than I ever enjoyed Lovecraft. I'm thinking of using this for the Diverse Voices square.